For years, [Rasmus] has left his computer connected directly to the mains power so that he can turn it on via Wake on Lan. While powered down, it would still continuously consume about 6W of electricity, but now that he didn’t need it to be on standby so often, he wanted to make it more energy efficient. In Denmark, where he lives, many people use power strips that have an onboard USB cable. These strips are meant to reduce the standby power consumption of PC peripherals such as monitors by powering on the mains sockets only when the computer is active. He decided the easiest way to cut his standby energy consumption to 0W would be to power his computer via this strip as well. While it sounds great in theory, it presented a sort of chicken/egg problem. If the computer needs to be turned on for the power strip to recognize it, then how could he also supply power to the computer from the same strip? His solution was a small circuit that would charge up while the computer was running, and still hold enough juice to kickstart the PC’s boot process, thus turning on the power strip. It really is an ingenious way to go about things, nice job! Neat hack, but I must point out… the cost of electricity in Denmark is about 45 cents (US) per kilowatt-hour. With his computer consuming 6W when switched off, that means each day it consumes $0.0027 dollars. (6W/1000*0.45). Assuming the electronics components cost about $30, it will take 11111 days ($30 / 0.0027) before the ‘savings’ in power pays for the cost of the components. Only after that point do you ACTUALLY start saving money. That’s 30 1/2 years, my friends. And only in Denmark, where power is crazy expensive… if this was the US, where power is about 10-15 cents per kWh, the number would be closer to 90 years! Neat project, but as an energy-saving device it’s bunk. I’ll bet he learned something during this project. Certainly about out of the box thinking, if not something EE related. Since when has this site been about the overall big picture anyhow? –Troll rat alert: something negative about green energy, something smarmy about government run amok, and a wisecrack about job creation…. in Asia. How long did he have that 90-watt (500 watt?) soldering iron on for to make it, and what was the carbon footprint to make it all? I poo-poo wind power for 85% of the USA and poo-poo solar for 75% of it. Not enough wind (and they need to be running full bore, minus maintenance time which in some cases is 20% of available run time) and not enough sun (Upper midwest only has 4.5 or less usable solar hours per day. Dont include tax credits, because that comes out of your pocket anyways PLUS interest. Add in wiring, an Electrician wiring it to NEC code, automatic and manual disconnect to the utility – so your system doesnt feed the main and kill someone working on a downed line estimate 10% increase yearly by new taxes and enviro fees – and you have a 50-year payoff for solar). I’m an electrician that deals with 2000+ solar panels on the roof of our building. Even our FatSpaniel software doesnt give us impressive numbers at all. Havent even paid off the cost of the installation yet. Inventive and cool hack. Not green, but I dont care. I like it. You guys turn off your computers? My harddrives live 10+ years since I’ve stopped turning off my comps. They’ve only died on start-up (or me hacking while it’s running and I pull an IDE cable out. Oops). Mine are always on. They heat my house a little, I just turn the heat setting lower. wow 10years. I hope that you keep your data backed up. Hard drives can fail while running. Had a spindle bearing lock up on a Hard drive once. I think that drive was about 15 years old, It definitely was over due. Incorect calculation. You forgot x24 and x365. Do the math! Not trying to be a douchebag but at 6W you wouldn’t hit a kW/hr until about a week of standby. In my area that’s about 10 cents. So this thing is saving less than a penny a day and should only take about 5 years to pay for itself. At 6W (or 0.006kW) it will consume 0.006kWh each hour, thats 0.096kWh/day or 35kWh/year (if it is off 16 hours/day). At 45 cents that would be an annual saving of $23. Hmm, it seems you are right — I forgot to multiply for hours. On another note: Wow, power in Denmark is expensive. My power bill in Denmark would be more than my rent! And again, your rent would be higher as the energie costs if you had to pay rent in Danemark. And again, your rent would be higher than the energy costs if you had to pay rent in Danemark. Well, I meant $15.8. $23 was if it was off 24 hours/day. Um…. Yeah… how about buying a power strip with a external switch and calling it done. turn off PC, flip switch. flip switch turn on PC. IF you are advanced, set the BIOS to turn on after power loss, save yourself a .00467seconds and the excruciating reach to touch it. On the Other hand , Where can you get USB triggered Power strips in the USA? we only get the crap that tries to detect if the system is on from power load, they rarely work. It seems you are having some issues with reading comprehension. How can he use WOL if the power switch has a physical button? My thought also. 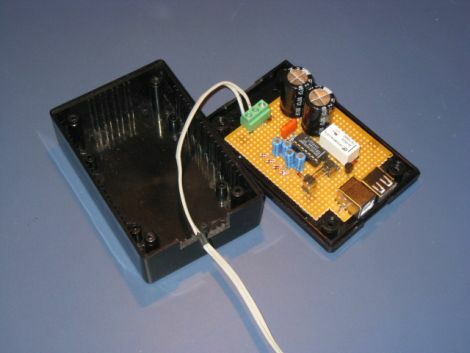 All you need is a battery(9V), a diode and a switch. The 5V relay will withstand the 9V battery for a little time. I find the device justified by a very simple reason: i cannot stand the high pitch sound the power supplies give when the computer/laptop is turned off. @Av your calculation is wrong…. by 24 times, you forgot the hours in a day. That’s about $2/month or $24 per year. The device should pay itself within a year. In it’s easiest form, I would have used a 9V battery. To make an elegant solution I would used an ethernet controlled relay. This gives the best flexibility plus extra functionality can be added. And it should consume less then 1W. Why not flip the breakers for the rooms that you want to turn off? Seems like a quicker solution to me, if you want to turn off the whole room. I thought of doing something like this, having 8~10 sockets controlled via XBee, so good for him to actually build it. Building things, even if they don’t make sense, is good experience. I call it a nice job, and a well documented website as well. So he has a USB power strip, and a complicated device to activate it from a manual switch on his desk, thus basically defeating the purpose of a USB power strip and making it like a normal power strip with a switch? What am I missing here? You’re missing the wake-up on LAN bit. Intelligent networks haven’t quite reaches the stage where they can physically flick a switch. Of course there’s a whole new possible project there. You may be missing that I don’t have to remember to switch the power off manually. This also means that I can delay the shutdown, e.g. if I leave the computer working after I go to bed, and still have it completely shut off. It is not wake-on-lan compatible, but I did include an extra input to the device in case I would want to power up from an external signal, this could be wired to my always-on server, etc. Regarding the motivation for this project: It was not the economics. We are a couple of guys at work who has been tracking our electricity use (automated reading of the blinking LEDs on our meters) and compared numbers. It turned out that I have a rather low consumption and that it would go as low as approximately 35W when I was not home and the compressor in the fridge was not running. I have consolidated the power supply for my network equipment (modem, router and server running of a single 12V supply) and it has a combined power consumption of around 20W. 6W is a considerable percentage of the remaining ~15W. That was the motivation! It is also way more convenient to power on the computer from a nice big button on the desktop than reaching for the tiny, almost hidden, button on the front of the computer, which is standing on the floor. + I was able to completely eliminate my “always on” power strip from the wire harness under the desk. Interesting approach. I would have triggered the start off of the mains but I am comfortable working with line voltage. The one thing I would add is a hand crank generator for those long down times that the leakage current would drain the caps. I should check how much power I am using in my home office when the computers are off (6 computers plus peripherals). My idle power usage may make something like this worth it. Although the last time I checked It was the 1500VA UPS that was the stand by hog at 100Watts unloaded. I don’t get it. You don’t have WOL working anymore when your computer is off. What’s the interest of this compared to a 1$ mechanical switch ? Would one of those timer travel power adapters we all use work if he knows his general schedule? They can be had at the thrift for .50 and involve a couple of plugs? It seems way easier and less snaky. I can see the point that this hack has used more energy than it will save, and it cost more than it will $ave. This hack might not be the best, but maybe he’s starting to think about how to make reducing power waste easier to do. I meant 500 million homes.